The new era in Australian luxury boating has arrived. Monday 26th of July, 2010. Gold Coast, Australia. Keith Hanson and the team from New Ocean Yachts Australia are excited to announce the arrival of the first boat in their New Ocean Yachts range. The stunning 640 Sports Yacht offers an exceptional fusion of European styling and design with incredibly good performance and an exceptional price. From the moment you step aboard you get a sense of a boat that has had no expense spared in offering the ultimate luxury boating experience. With the large hydraulic swim platform, mezzanine dining area and walk around side decks all featuring impressive teak flooring. Entertaining is a focus of the design with the large mezzanine with high gloss teak table flowing through stainless bulkhead doors and into a very roomy galley and saloon. On entry to the saloon you immediately feel the sense of space and natural light with large panoramic windows and a very open plan layout. The spacious galley features high gloss cabinetry with corian bench-tops. Plus a full length domestic fridge, convection oven, microwave and dishwasher drawer will impress the most discerning cook. The very roomy single-level saloon layout features a premium Ultra leather headliner and contemporary styled leather lounge. The elegant high gloss cabinetry and full timber floors are great examples of the quality that flows through the entirety of this stunning vessel. Below decks you’ll find a very comfortable VIP stateroom forward and a large portside guest cabin both with roomy en-suites. But without a doubt the most impressive feature is the full beam master stateroom featuring a king-size bed, large portholes allowing plenty of natural light and an impressive en-suite. Plus a 40” flat screen TV, starboard and port size stools and benches and cedar lined wardrobes complete the ultimate owner’s oasis. Featuring a pronounced deep V and driven by twin Caterpillar C18 shaft drive engines the 640 effortlessly rises to the plain and easily cuts through the most challenging swell offering the smoothest ride. The large engine room has roomy access to all components for ease of servicing and a very convenient service bench with sink and tap. The 640 Sports Yacht represents not only an incredibly impressive luxury boat but also the ultimate boat ownership experience. Keith Hanson and his team have developed a reputation for helping to guide their owners through the complete boat purchase experience plus offering many guided tours to some of Australia’s most stunning boating locations. 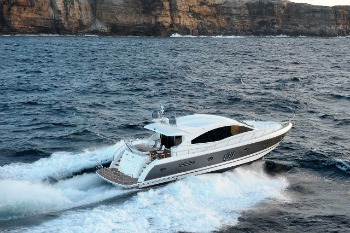 The 640 Sports Yacht makes its Australian debut at the upcoming Sydney International Boatshow.